Type Attitude in the search box and click on search button. You will see Attitude at the top. Go to Attitude page at http://wordpress.org/extend/themes/attitude . Unzip attitude.zip to your Desktop. Using an FTP client to access your host web server. Go to /wp-content/themes/ and make sure that you do not already have a attitude folder installed. If you do, then back it up and remove it from /wp-content/themes/ before uploading your copy of Attitude theme. Upload Attitude theme to /wp-content/themes/. Go to Appearance->Themes and activate Attitude theme from Dashboard. Attitude supports custom menu you can set it through following steps. Note: This theme has some extra widget with the theme i.e. Theme Horse:Custom Tag Cloud, Theme Horse:Featured Widget, Theme Horse:Services and Theme Horse:Testimonial. Attitude supports Custom Header Feature. Attitude supports Custom Background Feature. Note:The background effect will only seen if you set site layout option via Appearance > Customize > Design Options > Site Layout Options to Narrow Layout instead of Wide Layout. Go to Appearance > Customize > Design Options > Default Layout Options. In the dashboard. Go to Appearance > Customize > Design Options > Custom CSS input field. Create a page and choose Business Template from Template drop down. Choose Front Page Display->A static Page->Front page->Choose this page from dropdown. Theme Horse: Services Widget can be used to showcase your services. Upload Featured image i.e. service logo ( recommended size 80*80px ). Repeat step 1 and 2 for creating other service pages. Theme Horse: Featured Widget can be used to showcase your Recent work, Portfolio or anyway you like. Repeat step 1 and 2 for creating other Featured pages. Use Theme Horse: Testimonial Widget to showcase your testimonials. 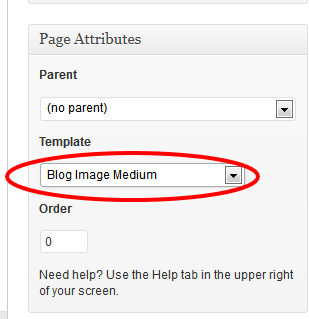 Create a new page, give it a name for example “Blog” and select page template from Template dropdown.